This morning was Bella's 1st Dentist appointment. We went to a pediatric dentist near our home. 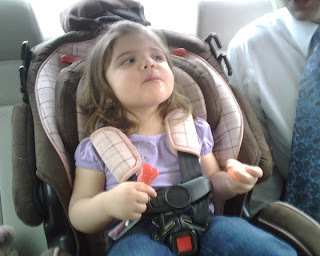 Eric & I both took her, and she had so much fun before going into meet the dentist because she was able to play wii and some other counting game while waiting for our turn. Once we went in, it was a different story. She cried most of the time and was scared to death! The staff was so nice and her dentist was quick and said her teeth look great! And that we are doing well giving her juice once a day and brushing twice a day! Below is a picture once we got back into our car. It was funny she cried most of the time, but once we left she said "That was fun!" 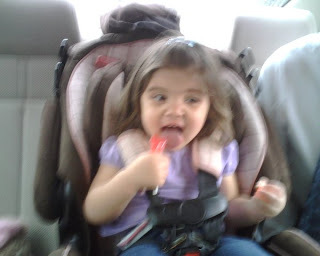 This one is blurry but she was so excited for a sugar free lollipop!